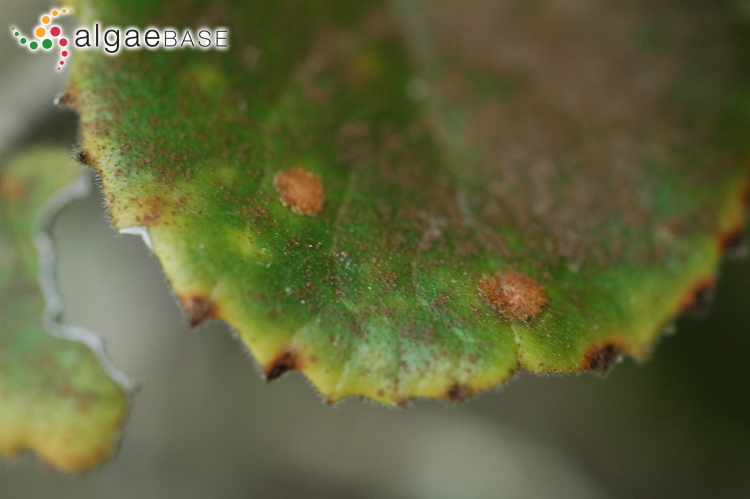 Robberg Reserve, Plettenberg Bay, Western Cape, South Africa; on surfaces of leaves on sheltered eastern side, with Phycopeltis spp.. 25 Sep 2005. Michael Guiry. © Michael Guiry (mike.guiry@nuigalway.ie). 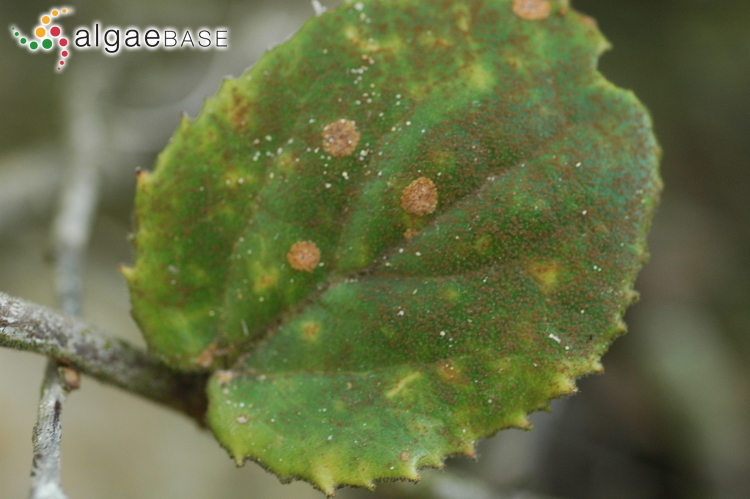 Robberg Reserve, Plettenberg Bay, Western Cape, South Africa; on surfaces of leaves on sheltered eastern side, with Phycopeltis spp. (darker orange). 25 Sep 2005. Michael Guiry. © Michael Guiry (mike.guiry@nuigalway.ie). Published in: Fries, E.[M.] (1832). Systema mycologicum: sistens fungorum ordines, genera et species, huc usque cognitas, quas ad normam methodi naturalis determinavit / disposuit atque descripsit. Volumen III et ultimum. pp. -524, -202 p. ["Index alphabeticus generum, ..."]. Grypiswaldae: Sumptibus Entestii Mauritii. This is the type species (lectotype) of the genus Cephaleuros. Participle (Latin), becoming green (Stearn 1973). Rindi, F. & López-Bautista, J.M. (2008). Diversity and ecology of Trentepohliales (Ulvophyceae, Chlorophyta) in French Guiana. Cryptogamie, Algologie 29(1): 13-43. Suto, Y. & Ohtani, S. (2009). Morphology and taxonomy of five Cephaleuros species (Trentepohliaceae, Chlorophyta) from Japan, including three new species. Phycologia 48(4): 213-236, 66 figs, 2 tables. Suto, Y., Ganesan, E.K. & West, J.A. (2014). Comparative observations on Cephaleuros parasiticus and C. virescens (Trentepohliaceae, Chlorophyta) from India. Algae. An International Journal of Algal Research 29(2): 121-126. Thompson, R.H. & Wujek, D.E. (1997). Trentepohliales: Cephaleuros, Phycopeltis and Stomatochroon. Morphology, taxonomy and ecology. pp. [i-vii] viii-x, -149, 60 pls. Enfield, New Hampshire: Science Publishers, Inc.
Accesses: This record has been accessed by users 6036 times since it was created. Chapman, R.L. & Henk, M.C. (1985). 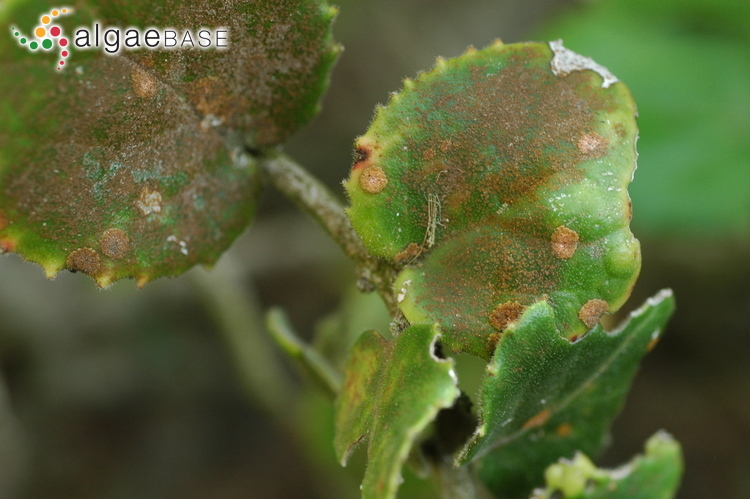 Observations on the habit, morphology and ultrastructure of Cephaleuros parasiticus (Chlorophyta) and a comparison with C. virescens. Journal of Phycology 21: 513-522, 21 figs. Chapman, R.L. (1976). Ultrastructure of Cephaleuros virescens (Chroolepidaceae; Chlorophyta). I. Scanning electron microscopy of zoosporangia. American Journal of Botany 63: 1060-1070. Chapman, R.L. (1980). Ultrastructure of Cephaleuros virescens (Chroolepidaceae; Chlorophyta). II. Gametes. American Journal of Botany 67: 10-17. Chapman, R.L. (1981). Ultrastructure of Cephaleuros virescens (Chroolepidaceae; Chlorophyta). III. Zoospores. American Journal of Botany 68: 544-556. Wolf, F.A. (1930). 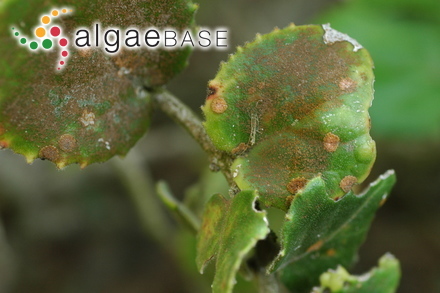 A parasitic alga, Cephaleuros virescens Kunze, on citrus and certain other plants. J. Elisha Mitchell Sci. Soc. 44: 187-205.